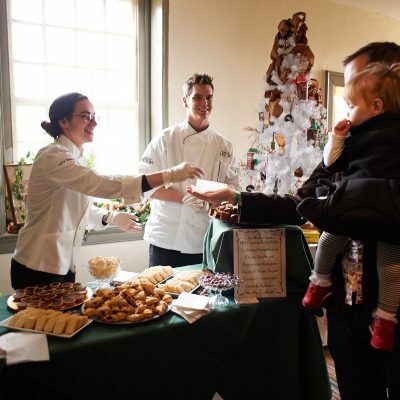 Bring your appetite and culinary curiosity to the historic houses as we celebrate some of Philadelphia’s best tastes for the holidays. All houses are located within East and West Fairmount Park in Philadelphia. Visit holidaysinthepark.com/your-visit and scroll down for an interactive Google map to get directions to each of the houses. Tickets are $30 and include entry to all five houses as well as house to house transportation via the Holiday Houses Loop Powered by PHLASH. Free admission for children 12 and under. No other discounts are available. Visit www.holidaysinthepark.com for further information including house addresses, transportation options, and the day’s performance schedule. Limited free parking is available at each location. The Historic Houses of Fairmount Park are some of the best-preserved examples of 18th and 19th-century early American architecture, all located in one of the country’s most beautiful urban parks. Promotion and programming for the historic houses are supported through a partnership between the City of Philadelphia Parks and Recreation Department, Fairmount Park Conservancy and various stewardship groups. Proceeds from this event support the ongoing stewardship, maintenance, and promotion of these treasures.